When does a pool need to be drained and refilled? 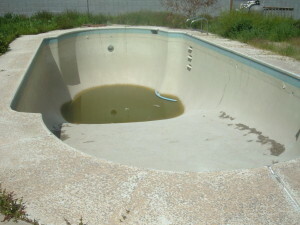 Well, there’s a few reasons why you would need to drain a pool. One of them is if repairs are needed like needing to replace drain covers or replacing a whole light unit although if it’s just for a light bulb and gasket sometimes this can be done without having to drain the pool if the electrical lead on the light is long enough that it can be brought up onto the deck for repairs. Another reason to drain a pool is high levels within the water. As pool water ages, some levels like the calcium hardness, cyanuric acid levels (CYA) and total dissolved solids (TDS) within the water register high. The only way to reduce these levels is to replace the water. Adding more chemicals will not have any effect on these levels and it becomes harder to manage and balance the water chemistry. Options to consider when having your pool drained is an acid wash of the pool surface to help remove stains that can be caused over time. Also, consider having any other repairs like lights and drain covers done at this time. If there is a large buildup of calcium deposits on your tile line this would be a good time to have this removed. A small amount of buildup on the tile can be removed using a pool stone that is rubbed on the tile line to remove the deposits. If it’s a large buildup then you’ll need to consider having it removed by a process called “bead blasting” the tile. Bead blasting is a process of removing deposits by spraying fine sand at high pressure without damaging the tiles surface that removes the deposits. PoolStar does not provide this service but we can refer you to a company that does and coordinate it to be done if the pool is drained. A water test will determine if the water needs to be drained or not. If you have questions regarding the above please contact PoolStar we shall be happy to help. This entry was tagged Swimming pool drain, Drain a pool, Las Vegas pool drain, Acid wash pool, Henderson pool drain. Bookmark the permalink. ← How to turn on a spa.